Technology is a funny thing in the retail world. Thanks to technology, online shopping continues to increase and foot traffic gradually decreases as we point and click deeper into the ocean of the digital age. But as we’re beginning to learn, technology is also one of the keys to keeping shoppers in-store via the visual appeal of digital signage and video walls. Why? Because experiences are just as important as convenience to today’s tech savvy consumer – if not more. Consider this stat: 78% of Millennials say that they would rather spend money on a desirable experience than buying something they want (Eventbrite / Harris Survey, 2014). In other words, experiences matter to shoppers. Big time. Here’s another stat: 68% of Americans say they’ve made purchases of a product or service because it was featured in digital signage (Bunn, 2016). In other words, digital signage drives sales. Big time. So here we are with a target customer that prioritizes experience and convenience. Oh, and by the way, they really like the appeal of techy things, and those techy things can influence their purchase decisions. Retail digital signage sure does check off all of the boxes, doesn’t it? Now before you go hanging a bunch of screens on the wall, read below and we’ll break down the checklist for implementing successful signage at your business. Deploying signage just for the sake of having it is never a good idea. Your signage needs to be designed with specific purposes in mind if it’s going to achieve the results you’re looking for. Depending on the needs of your business, you may need to serve only one purpose or both. If you’re a small boutique apparel company, you’d likely want some ambient signage to help bring vibrancy to your space. On the other hand, if you’re a large grocery store, then you probably prioritize using your signage to promote certain items. As such, you’d likely have a variety of applications for signage, such as full-service departments, the coffee shop, or even the new endcap signage that is beginning to pop up. No matter what type of business you own, make sure you understand the intended purpose behind retail digital signage before you make the investment. Also, when you first implement your solution, prioritize what is most important to the success of your business – aesthetic appeal or product promotion. Doing so will help you lay out your placement and content strategy. When you’re flying towards the bright lights of the world of digital signage, it’s natural to want to deck out your entire store (or network of stores) in screens right off the bat. Of course, you don’t have to. Some companies that are new to retail digital signage like to pilot test their solution in a single store or handful of stores to figure out what works and what doesn’t. For instance, maybe the screens you placed in the shoe section aren’t influencing sales on the new line of sneakers you’re promoting, but you’re getting great results with signage in the outwear department? Or if you’re running a grocery store, perhaps it’s time to switch from static digital signage in the meat department to short video clips in order to get the results you’re looking for? Once you learn what works, you can apply the same strategy throughout your store and/or across multiple stores to truly make the most of your solution. 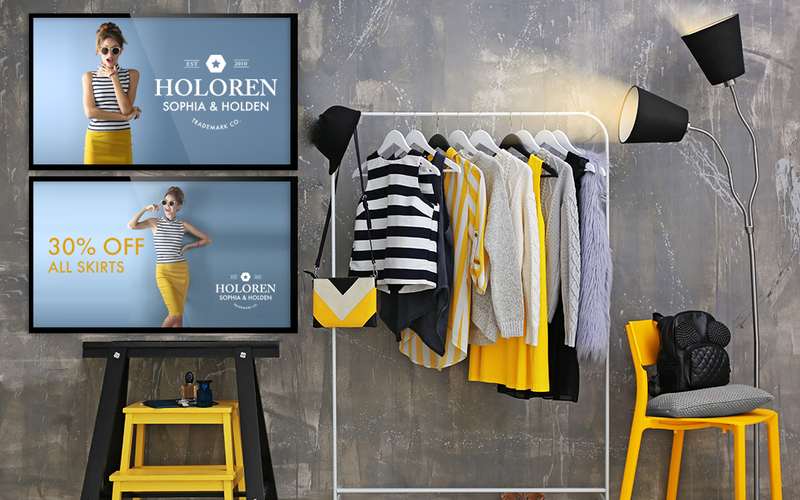 Incorporating digital signage into your in-store experience makes a big statement to your customers. It’s like saying, “Yeah, we’re the REAL deal.” That’s because digital signage looks much more expensive than it really is. It’s actually really affordable when you go with the right provider. What kind of signage would I want to see? Where would I want to see it? Sporting Goods – Lifestyle videos promoting sneakers, sports equipment, etc. If you want really captivating content, it’s always a good idea to work with a professional that knows how to create retail digital signage content for specific commercial applications. At Mood, our visual designers have tons of experience serving retail clients, and they know just what type of signage retail customers want to see and where they want to see it. Simply put, this is a project you definitely want to leave to the pros. Blank screens are not good. The sight of a black screen can spoil the customer experience and give the impression that your company isn’t on top of its game. As is the case with any kind of technology, some digital signage solutions can be prone to technical issues, which is why it’s so important to go with an experienced provider that offers reliable digital signage players, software and content creation. Such integrated solutions are designed to work in unison, ensuring maximum reliability and ease of use. Additionally, you want a provider that also offers installation and on-site service. A reliable solution begins with proper installation, and in the event that something goes wrong, it’s always good to know that your provider can send someone out to take care of any issues. Looking to check off the boxes on your retail digital signage checklist? Contact Mood Media today and talk to one of our visual experts about it. We’ll show you just how easy and affordable it is to captivate your customers and implement a retail digital signage solution that drives results.